Assemblyman Erik Dilan joined residents at Arlington Village and the Coalition for Community Advancement on Thursday to call on the city to remove the 210-unit housing complex from the East New York rezoning plan. EAST NEW YORK — Local residents and elected officials are calling on the city to remove a more than 300,000-square-foot housing site from the proposed East New York rezoning plan, saying the property deserves greater focus and its own review process to benefit the community. 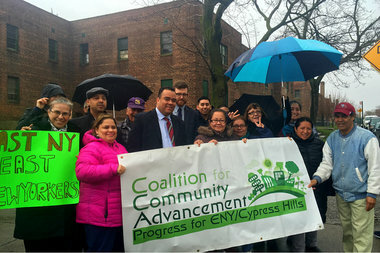 Rallying in the pouring rain Thursday, Assemblyman Erik Dilan joined members of the Coalition for Community Advancement and tenants outside of Arlington Village to ask developers and the property's new owners to consider the interests of longtime residents. Due to the site's history of neglect under previous ownership, advocates say more community input is needed for future plans to ensure locals will still have a place at the development and won't be pushed out with the rezoning. The coalition has provided input to the city with its own alternative rezoning plan. “This is one of the largest sites in the community that has the potential for schools, has the potential for community facilities, and deep affordable housing, and that potential cannot be realized through this rezoning,” said Humberto Martinez, technical assistance provider for the Coalition. The two-story, mostly-vacant residential complex takes up two full blocks in East New York, and is part of the city’s plan to rezone the neighborhood. Under the proposal, Arlington Village could be up-zoned where developers could build up to 14 stories with commercial ground floors along Atlantic Avenue, five stories on Berriman Street and Montauk Avenue, and up to eight stories with commercial ground floors along Liberty Avenue. Coalition members and Dilan said affordable housing is at the top of their list of needs, but the poor conditions Arlington Village has been under over the past decades with high vacancy rates and low maintenance makes it a prime spot for real estate speculation. Developers stand to benefit from an up-zoning, and low-income, longtime residents could be displaced, they added. “Do we want them to create affordable supply? Absolutely we do,” Dilan said. In spring of 2015, Arlington Village was sold to 3124 Atlantic LLC and 3100 Atlantic LLC, both under investment firm the Bluestone Group, for a total of $30 million, according to city records. A representative from a brokerage firm in the sale previously told The Real Deal that Bluestone’s Eli Tabak and his partners were looking to redevelop the property as affordable housing. A spokesperson for Bluestone could not be immediately reached for comment. Tenants at Arlington Village and community members complained Thursday that the property has been neglected for more than 30 years under the former owner, Rita Stark of Atlantic Stark Properties LLC. Moises Coello, who has lived at the housing site for 43 years, said majority of the units have been empty for decades, and other tenants and community members said they had tried to reach out to Stark to advocate for “safe living and decent standards,” but received no response. Stark was not immediately available for comment. The issues at Arlington Village over repairs have not improved under new ownership, residents say, and many have faced harassment with offers to relocate, according to Brooklyn Legal Services Corporation A staff attorney Adam Meyers. While problems maintaining the property persisted long before it switched hands, Dilan said that Bluestone “could have done better absent of the rezoning,” and questions need to be answered about the future of current residents. In a 2014 planning study examining the potential for growth in East New York, the city cited the Atlantic Avenue apartment complex as having “fallen into a state of disrepair” and being only partially occupied. The report also identified Arlington Village as having potential future use for mixed-used development with affordable housing, open space, and retail along the major thoroughfare. New housing is not currently permitted in the zoning district found along most of Atlantic Avenue, according to the city. The city said they continue to have “productive conversations” on the rezoning plan with Councilman Rafael Espinal, who represents the neighborhood. “Since the beginning of the East New York planning process, we have been and remain committed to ensuring that the final proposal to be voted on by the City Council meets the affordable housing and community infrastructure needs of East New York residents,” mayoral spokesman Austin Finan said. Espinal said that he’s met frequently with the Coalition about both Arlington Village and the rezoning proposal. The City Council is expected to vote on the East New York rezoning plan this month.